As we climbed into bed each evening and pulled the covers up to our chins, a daily ritual began for my brother and I when we were kids: the bedtime story, usually told by our dad. One of those stories, a 1950’s fairy tale, was different. 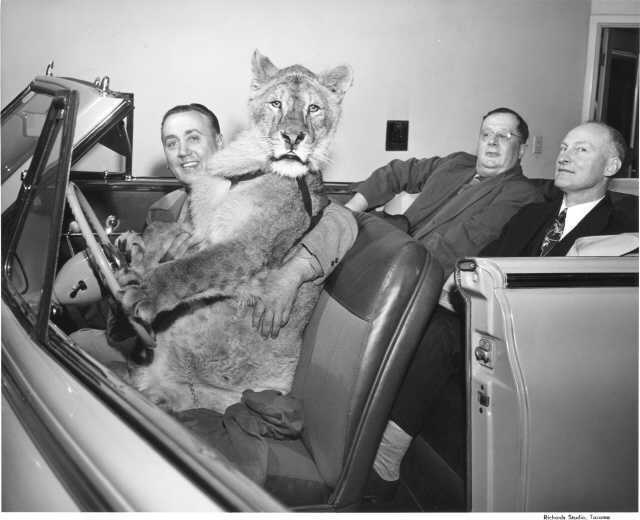 It was a true story about a rescued African lioness who lived as a tame tabby cat with a Washington State couple, and my grandpa Folkenberg’s visits with the young lion. Unfortunately, this bedtime story does not have a pretty beginning. 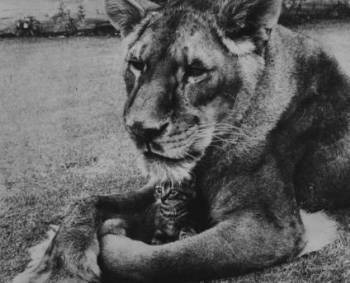 Little Tyke was born at the Point Defiance Zoo in the late 1940’s in Tacoma, Washington to a lioness who had killed her previous five cubs. The small cub nearly suffered the same fate; as her mother flung her against the bars of the cage severely injuring her. A couple, George and Margaret Westbeau, who ran a rescue ranch, The Hidden Valley Ranch, in a neighboring town, took the small cub home. A constant round of bottle feedings and bandage changes (which caused excruciating pain to the cub), brought her back to health and she grew up to be a 350 pound lioness who lived in the house like a domestic tabby cat. Little Tyke cuddles a kitten between her paws. She lounged on the kitchen floor, loved watching TV from her seat on the sofa, and napped with her head resting on the lap of Margaret Westbeau. When the Westbeaus took road trips with her, she would often stick her shoulder and paws out of the car window, her fur blowing in the wind. Pit stops were made and she would take care of business by the side of the road, just like a well-trained house pet, never running away. If the Westbeaus stayed in a motel they always got one room with two beds: one for them and one for Little Tyke. Part of the Zoo’s motivation in allowing the Westbeaus to rescue the injured cub, was that George owned a freezer plant, where he stored large amounts of meat. And there could be no better home for a carnivore who eventually reached 350 pounds, than a family who owned a meat freezer plant. Lions eat up to 16 pounds of meat a day. But there was one glitch, Little Tyke refused to eat meat, no matter how hard the Westbeaus tried. They would decrease the amounts of meat in her food to miniscule portions, but she still refused. They were so desperate that they even tried going from just 10 drops of beef blood to one drop of blood in a meal, but Little Tyke turned up her nose. There’s even a photo of George holding a cut of meat up to her while she turns her head away. They finally gave up and served her a special vegetarian diet that would take care of her nutritional needs. It’s unclear how my grandparents, who lived in California, knew the Westbeaus. They had numerous relatives in the Portland, Oregon area, so perhaps there was a connection there. Several visits were made to the ranch; to my grandfather’s delight, but to my grandmother’s apprehension. My grandfather would rush out of the car to greet Little Tyke, who placed her fore paws on his shoulders, embracing him. They would roll around the kitchen floor playing together while my grandmother would remain in the car, or stand off to the side, stiff-lipped and frowning. The magnitude of the visits was so great that my grandfather could talk of nothing else for days when he returned home. Little Tyke defied expectations in another respect–her species’s reputation for being fierce hunters. 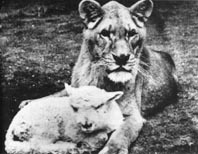 Her favorite companion, for example was Becky, the lamb, who often rested between her paws. Little Tyke with Becky, the lamb. Other photos show Little Tyke with a kitten between her fore paws, a small toddler climbing on her, and day old chicks frolicking around her. She would even allow “Imp,” a black kitten to share her food. She wandered among the peacocks, who also lived on the ranch. There are also home movies, which show Little Tyke walking with Margaret in the snow and cuddling with her, cheek to jowl. In another scene, George climbs out of the river in his swimsuit and wrestles with his favorite feline friend. Of course, Hollywood soon beckoned and that rarely ends well. Cecil B. DeMille, an early Hollywood producer and director, had Little Tyke audition in 1952 for a part in “The Greatest Show on Earth.” And in 1955, Little Tyke appeared in Art Baker’s popular TV show, “You Asked for It.” After her final TV appearance that same year, Little Tyke became ill with viral pneumonia, and died in July in the arms of George at Hidden Valley Ranch, her home. The stress of filming and the sudden change in climate from Washington to California had been too much for her. She was nearly 10 years old at the time of her death. Little Tyke helps sell cars at a local auto dealership, Herb Satterlee Motors. George Westbeau sits in the front. My brother and I loved the story of grandpa and Little Tyke, told numerous times by our dad at bedtime. It wasn’t your typical fairy tale, but it had many of its elements: enchantment, magic, wonder, and a most fantastic creature; a lion, who was so tame that you could pet and frolic with her. But fairy tales also resonant with adults…at least this adult. The story of Little Tyke delighted and shocked me and gave me a glimpse of something greater. That the improbable could happen. That miracles might be possible. Yes, it was pretty awesome. He loved making visits to the owner’s home to see Little Tyke.